Hangovers often leave you with a combination of less-than-desirable symptoms. Nausea, stomach upset, headache... no thanks. Although there's no guarantee of a diet that will cure you of your pain, you may be able to offer some relief. 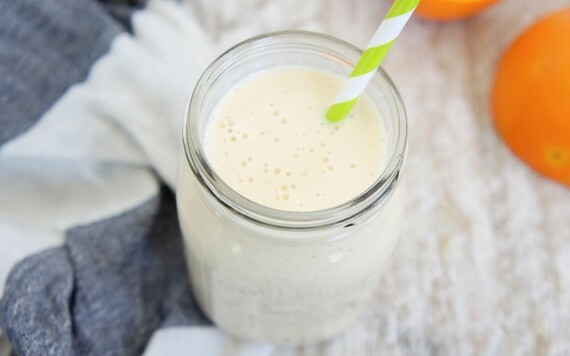 Now this isn't just a hangover cure smoothie. Even if you wake up feeling chipper as ever, it's still a great way to get the year, or any day for that matter, started on the right foot. It's packed with tons of nutrients for a healthy gut, glowing skin and energizing fuel. If you do happen to wake up January 1 feeling less than stellar, this is definitely the answer. I know they say that the best thing to do is prevent a hangover in the first place, but if you're coming back to this, it might already be too late. I've put together this hangover-curing smoothie to help you get back on track and feeling like yourself again so that you can get excited for everything this year has in store! If part of your plan to kick off the new year includes getting back to some healthy home cooking, join me here and I'll show you how to get your weekly meal prep done in just one hour. Hangovers often leave you with a combination of less-than-desirable symptoms. Nausea, stomach upset, headache... no thanks. These are the result of a combination of factors including dehydration, low blood sugars, and inflammation caused by alcohol byproducts and our bodies trying to metabolize them. Nausea, stomach upset, headache... no thanks. Although there's no guarantee of a diet that will cure you of your pain, you may be able to offer some relief by loading up on the following. Alcohol triggers the loss of fluids from our bodies which is often responsible for the pounding headache and feeling groggy and lethargic. Water is a great option, and so are electrolyte-rich drinks like sports drinks or fresh, 100 per cent fruit and vegetable juices. If you prefer something warm, teas are a good option. See below for my top tummy-taming picks. Broths are another way to get some fluids and salt (which helps you to retain those fluids) into your body. Fructose is a natural sugar found in fruit that may play a role in speeding up alcohol metabolism. Fruits that are particularly high in fructose include pears, apples, cherries, mangoes, bananas and pomegranate seeds. This antioxidant helps fight off free radical damage to cells that can be caused by alcohol. Vitamin C rich foods include oranges, strawberries, bell peppers and broccoli. Plant-based fats like avocados or nut butters can help stabilize blood sugars. 1. Place all ingredients in a blender and blend until smooth, about 30 seconds.